"I won't say I'm desperate, but I'm certainly pushing hard to get that win." With 20 players within five shots of the lead, Padraig Harrington knows he will have to get aggressive in the final round of the Deutsche Bank Championship in Boston. Tied for fourth, just a stroke behind Steve Stricker, Sean O’Hair and Retief Goosen after his third 67 on the trot, the pressure is the Irish star to come up with the goods for his Boston Irish faithful. Harrington is 14th in the Fed Ex Cup rankings but could move comfortably into the top five with two events remaining, if he can pull off his first tour win since last year’s US PGA. “Well, there's going to be a lot of expectations,” Harrington said of his status as a home hero for the Boston Irish fans. “It's going to put a lot of pressure on me tomorrow. The key in this FedEx Cup is you've got to win one of the first three at least and then that puts you in position that if you win the last one you're going to be the big-time winner. I suppose I'm pushing hard. I won't say I'm desperate, but I'm certainly pushing hard to get that win. “There are a lot of people in contention, and that is going to be an issue. You're going to question whether somebody is not going to need to shoot a low one from where they are. You could see somebody shooting 64 tomorrow. With thousands of Irish Americans roaring him on, this is like a home game for Harrington. 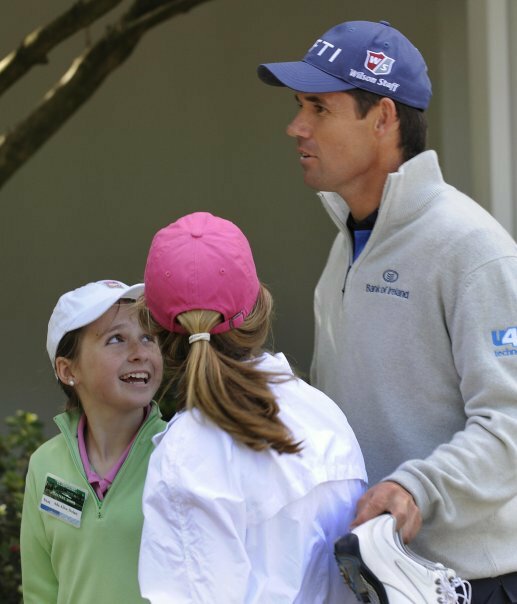 “Everywhere I walk, onto every green, onto the tees, betweens greens and tees, great support,” Harrington said. “There’s a saying - there’s five million people in Ireland and 40 million Irishmen in the States. I think all 40 million live in Boston. “It does give you a buzz. There’s no doubt that when it all gets behind you, it’s very positive. If they weren’t behind you, you’d have to knock it down the pole because it’s a different kind of focus. As for Tiger Woods, the world No 1 is nine strokes off the pace on four under after a one over par 72 in the third round. Not even Woods can come back from there. Padraig Harrington took his August earnings to a cool $1.3m at The Barclays and set his sights on a $10m FedEx Cup delivery. The Dubliner continued his amazing turnaround in form when he snatched a share of second place behind shock winner Heath Slocum in the first event of the PGA Tour’s megabucks play-off series. Sunday’s tie for second with Tiger Woods, Ernie Els and Steve Stricker was the 33rd runner-up finish of Harrington’s career, boosting him from 66th to 14th in the FedEx Cup points race. No disrespect to the Irish PGA but Padraig Harrington has decided that it’s time to win again. Padraig Harrington was in fine form at his Boston press conference.Thirteen months after he lifted the Wanamaker Trophy, he knows that he only has three more chances to get something positive out of his PGA Tour season. “I'm running out of time in terms of this year, and maybe that's a little bit why I played better the last couple of weeks,” Harrington said in Boston, where he is one of the favourites to win the second leg of the FedEx Cup play-offs, the Deutsche Bank Championship. Padraig Harrington's magical short game has given him a chance to win the Deutsche Bank Championship and the $10m FedEx Cup. The Dubliner carded a third successive four under par 67 at TPC Boston on Sunday to trail leaders Steve Stricker, Retief Goosen and Sean O'Hair by a shot on 12 under par entering Monday's final round. Padraig Harrington had a one stroke lead as he headed down the stretch in the Deutsche Bank Championship. He finished birdie-birdie. He shot 68. He totalled 15 under. His short game was amazing. But he didn't win. In the end, he finished up two shots behind Steve Stricker, the new leader of the FedEx Cup standings. "I was due to not get away with it at some stage"
Like a man bounding along a high wire with gay abandon, Padraig Harrington continues to astound in the FedExCup play-offs. Occasionally he does the splits and appears certain to hurtle to the ground only to grab on by his toenails and rectify the situation with a triple somersault.